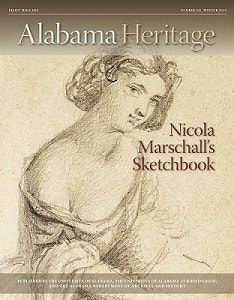 The Winter 2019 issue of Alabama Heritage magazine uncovers an early sketchbook by Nicola Marschall. Author Wolfgang Ulbrich acquired the sketchbook from Marschall’s descendants and discovered several pencil drawings of Alabamians. The sketches offer insights into both the Alabama artist’s practice and 19th-century life in the state. Author Mollie Waters looks into the mystery of Francis Bartow Lloyd. When the prominent Greenville, Alabama, citizen was gunned down in the summer of 1897, his legacy as a writer became overshadowed by his murder. In Alabama’s Magic City, the Kiwanis Club transformed its ideal of service from illusion to reality. Historian James Noles Jr. recaps the 1919 International Kiwanis Club Convention. Laura Rogers explores a little-known island in Mobile Bay – Mon Louis Island, a French land grant, a Creole village and a seafood community – that holds a rich and complicated history. Regular departments found in the Winter 2019 issue of Alabama Heritage include Alabama Makers, Behind the Image, From the Archives, Adventures in Genealogy, Nature Journal, Reading the Southern Past and much more. Alabama Heritage, celebrating more than 30 years of fine publishing, is co-published by The University of Alabama, the University of Alabama at Birmingham, and the Alabama Department of Archives and History. The quarterly magazine covers a variety of subjects related to Alabama history and culture, and has garnered numerous local, regional and national awards over the years.